Fish House at Four Seasons Resort Oahu at Ko Olina is one of my new favorite restaurants on the island, offering great food, service, and views. After eating some very tasty tacos at the Dub Box just outside the restaurant on a recent Taco Tuesday, my friend and I went into Fish House for dessert. After perusing the dessert menu, I decided upon the Chocolate Cream Pie - OREO Crust, dark chocolate cream, vanilla, chocolate shavings. It was pure chocolate decadence! 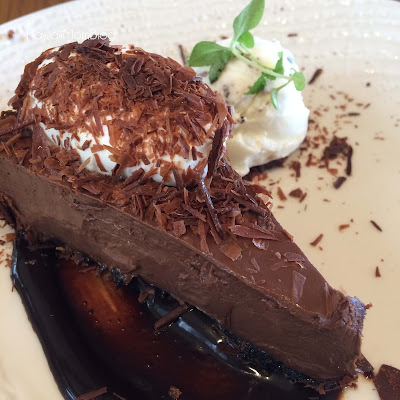 The Passion Fruit Carrot Cake is amazing as well, but if you love chocolate, definitely try the Chocolate Cream Pie.